Have you ever faced a situation to record your phone call for business or personal issue ? If yes, then you may have noticed that your smartphone doesn’t have this feature built-in or the recording feature is bit too complex to access. If you are an Android user, you have plenty of apps in the Google Play to record phone calls. However, those apps are buggy and not future rich. I’ve also faced the similar situation and searching for the Good Phone Recording app, finally I’ve found the “MP3 InCall Recorder“. It’s an awesome app that has done its job what it claims in the play store. InCall Recorder is the Android app that gives the power to you to record your Phone calls in real-time simply and efficiently. If you are an Android for a quite some time, you may be aware that recording the phone call is not so simple in your smartphone. InCall Recorder is very user-friendly, when you the launch this app for the first time it will show the on-screen tutorial and its features to record the calls effectively. This app is very simple to use, as well recording the calls in the Mp3 format and has high quality Voice recorder. When you receive the phone call, just tab or slide the top left or right side screen of Incoming call screen. This app will begin the process and will record the call. Unlike other apps, you don’t need to open the app and start the recording of the call, just one tab will record any call without delay. To record the phone call this app has two option: You can Automatically Record the call, Manually record the calls like above. The Recorded files are relatively very small and stored in the specified place. For example,. if you record the 1 hour-long period call, this app will create merely 7 MB File. This app has the best tool to amplify sound for clearer and better audio files when you record the noisy calls. You can also create a new MP3 file from existing one after repairing and removal of a specific section of your choice. Once you finished the correction, you can upload and share the file to WhatsApp, Dropbox and Gmail. 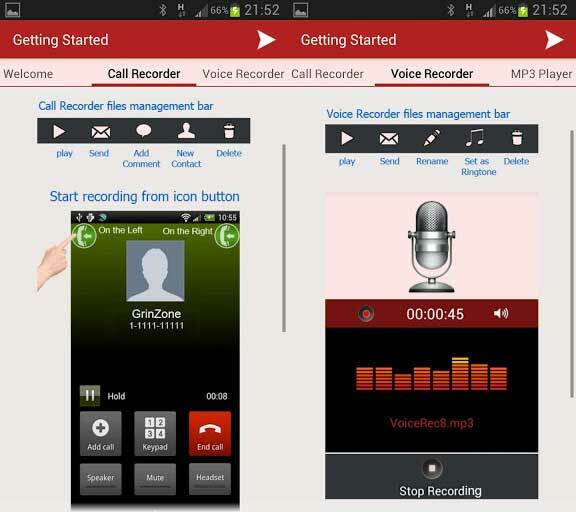 This app also has the High Quality Voice Recorder which has all the features of Call Recorder such as Recording the voice, editing the voice and adding notes to it. You can also set those recorder audio file as ringtone and notification tone. InCall recorder is the way better call recorder app than its competitors in the Google Play. Also, It is free to download and use. This app is worth a try, definitely will get a place in your Android app collection.